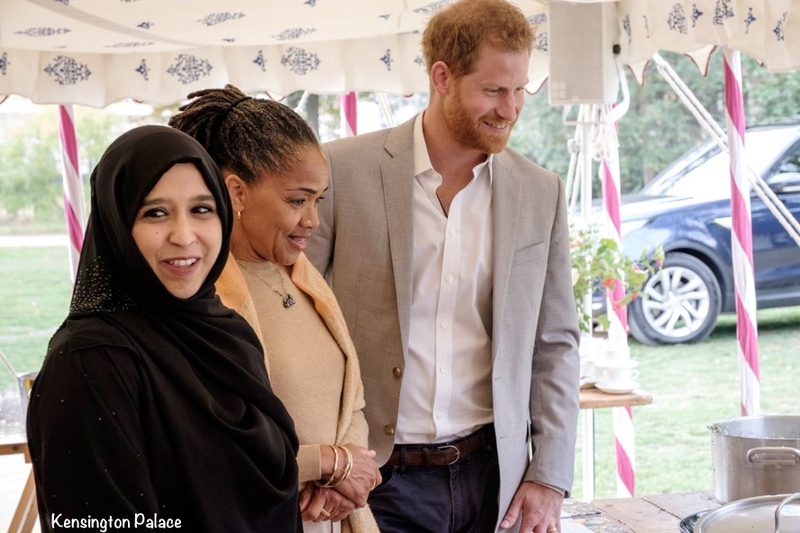 Meghan Markle’s mom, Doria Ragland, was the surprise guest at the luncheon on Perk’s Field, outside Kensington Palace on Thursday. A video tweeted by The Telegraph’s Hannah Furness shows the trio arriving for today’s event. All proceeds will go back to the Hubb and the book is available in stores this week. Hubb means “love” in Arabic. Chris Ship of ITV shared a video of Meghan, Doria and Harry as they approached the tent where today’s lunch was being cooked. The event included women from The Hubb as well as guests involved in the book’s publication and the Royal Foundation. It was a cool day, with the temperature about 65℉ when the event got underway. It was also breezy, as you can see in this video. A look at the setup for today’s meal comes via Hannah Furness. Meghan was clearly in her element. All of the dishes on the menu are from recipes included in the cookbook. A look at lunch as it was being prepared. More from The Sun’s story about today’s celebration. 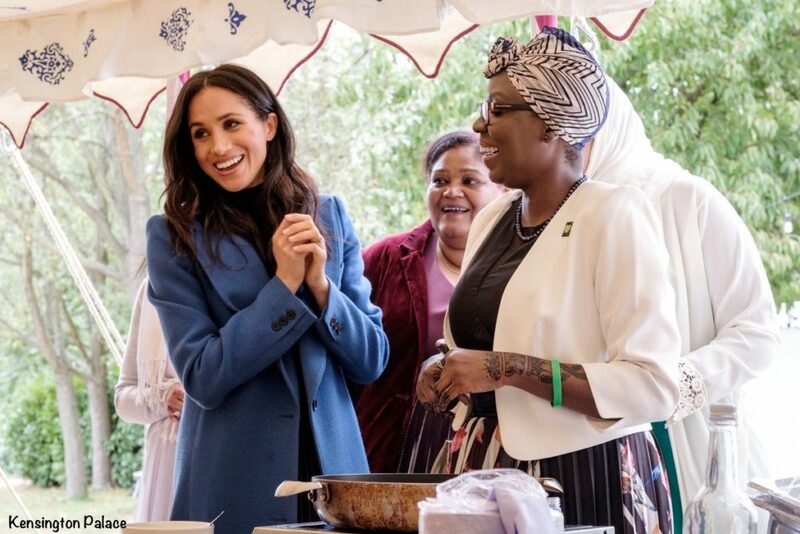 Meghan called the book “a tremendous labour of love” in a speech to volunteers from the kitchen and paid tribute to their community spirit. You can see the full speech in this video. 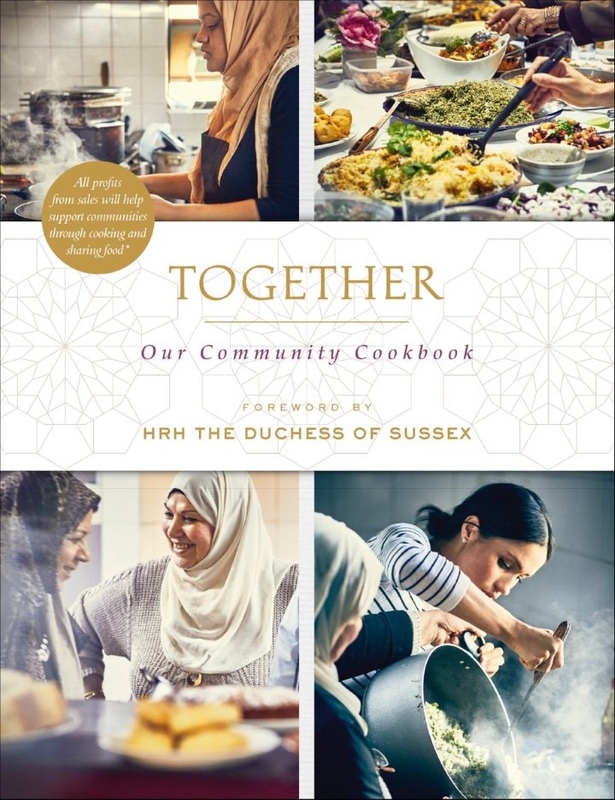 Watch Meghan’s full speech at the event to launch ‘Together’ cookbook which showcases recipes from some of those affected by the Grenfell Tower fire. 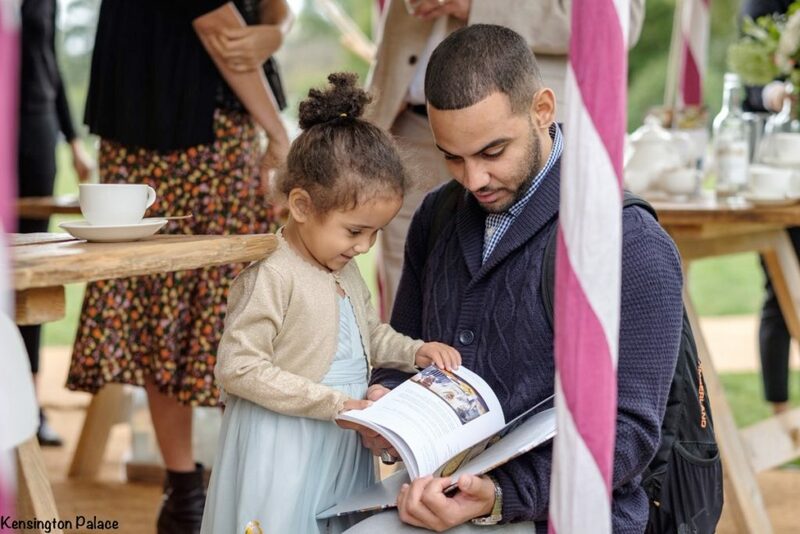 Perhaps we see a future chef enjoying her look at the just-released cookbook? 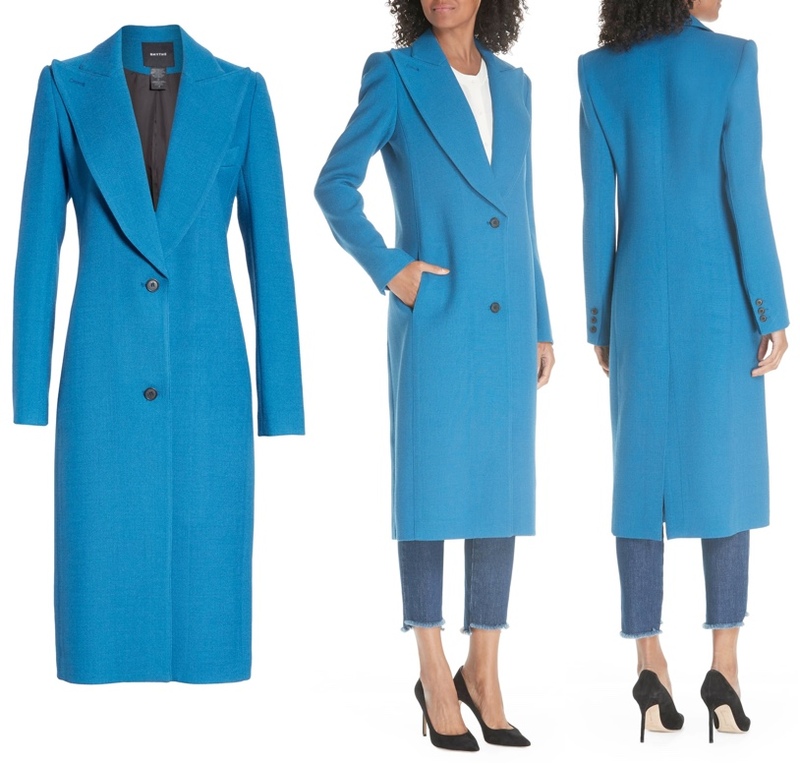 Now for a look at what Meghan wore, starting with her Smythe Peaked Lapel Coat in a color called Zephyr. The piece is a wool/viscose blend. It features a notch collar, side pockets, back vent and buttons at the cuff. 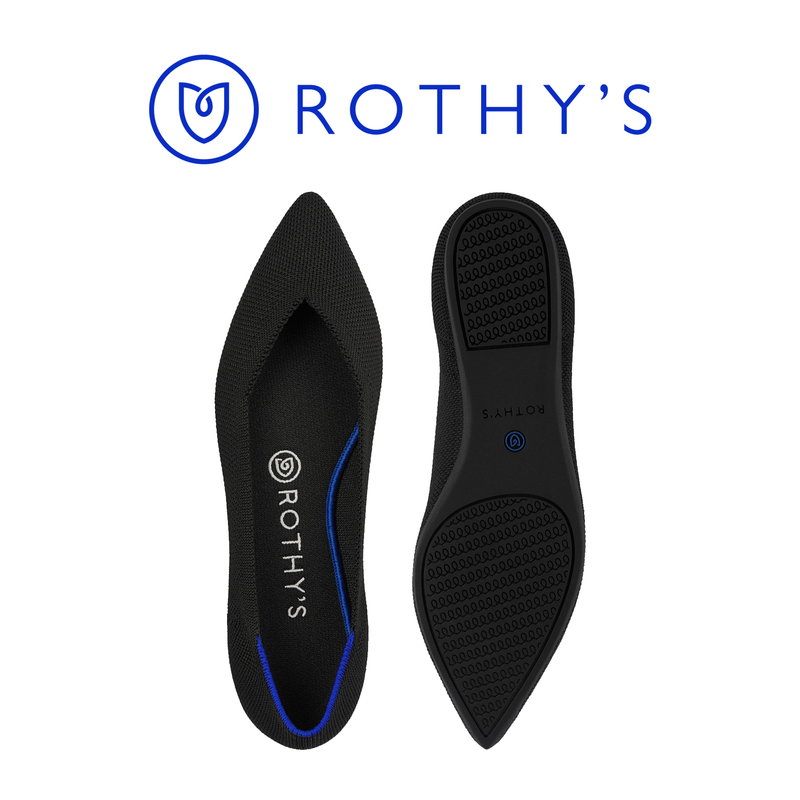 We show it at Nordstrom, but it is also available in limited sizes at UK retailer Atterley (£919); Atterley ships free in the UK and USA. 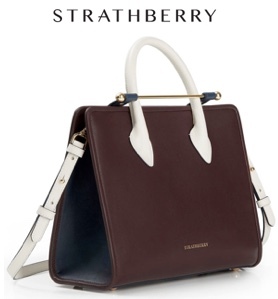 The piece is also offered at Shopbop ($1195), and it is also available in very limited sizes at Saks. 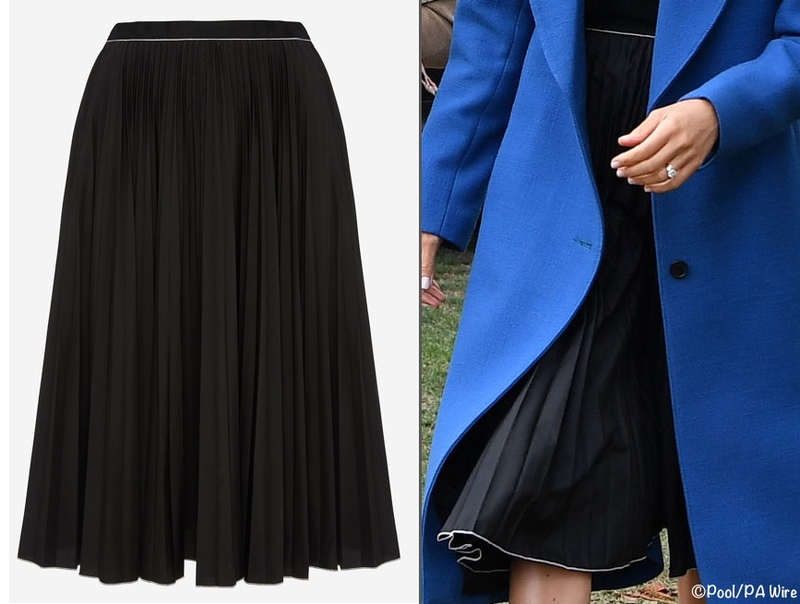 Meghan’s skirt is from her friend Misha Nonoo’s brand, the label’s Saturday Skirt ($250). The skirt is polyester skirt is accented by white piping at the hem and waistband; it has a side zipper and comes in sizes XS to XL. Our thanks to Laura for her ID of the skirt and coat. The Duchess wore another familiar brand; her top is the Tuxe Bodywear Renegade ($110). The ribbed piece is a blend of Modal/Spandex. 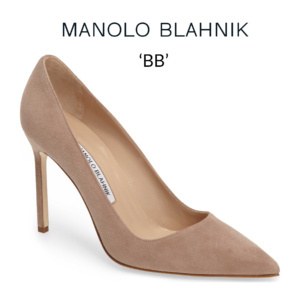 We saw the return of Meghan’s Sarah Flint Jay Pumps ($395), a favorite style for her. In her column for The Telegraph, Chloe MacDonnell also noted what Doria wore for today’s party. 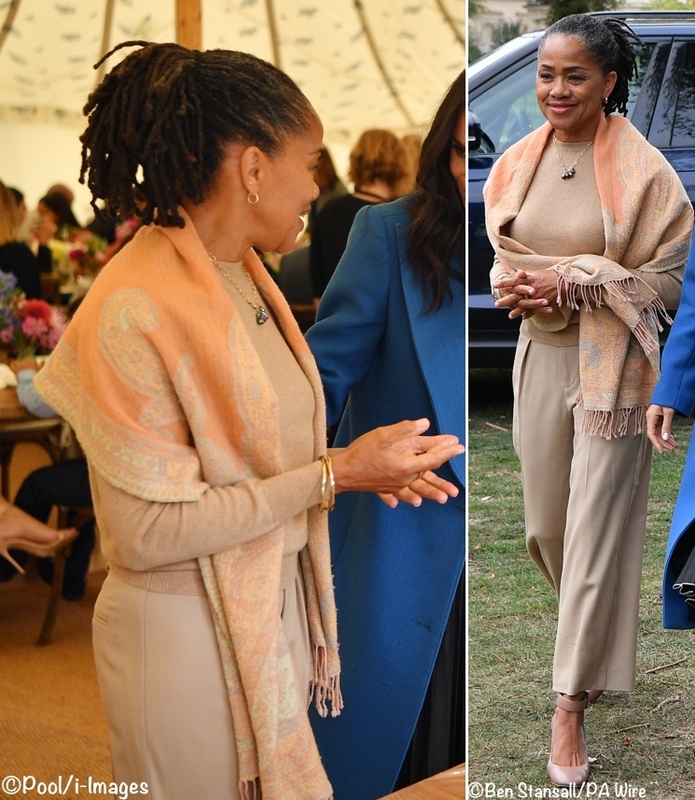 Meanwhile, Meghan’s mother Doria, who had flown from LA to London to support her daughter, also offered a lesson in transeasonal dressing. Opting for a pair of caramel hued trousers and matching lightweight knitted top, the social worker/yoga instructor layered a honey-coloured printed pashmina over the top. We’ll share info on these items should we be able to ID them. UPDATE: Doria’s shoes are by Stuart Weitzman, the brand’s Clara style in Camel nappa leather. The shoes retail for $525 and are currently on sale at the following sites in a number of sizes: Nordstrom Rack, $239 and the Outnet, $233. Special thanks to Chris Ship of ITV and Hannah Furness of The Telegraph for sharing photos and videos all morning, as well as innominate93 for her ID efforts. We’ll leave you with our graphic look at what Meghan wore. look, Beatrice wore the same skirt a couple of days later. What a great look! Very professional and event-appropriate. 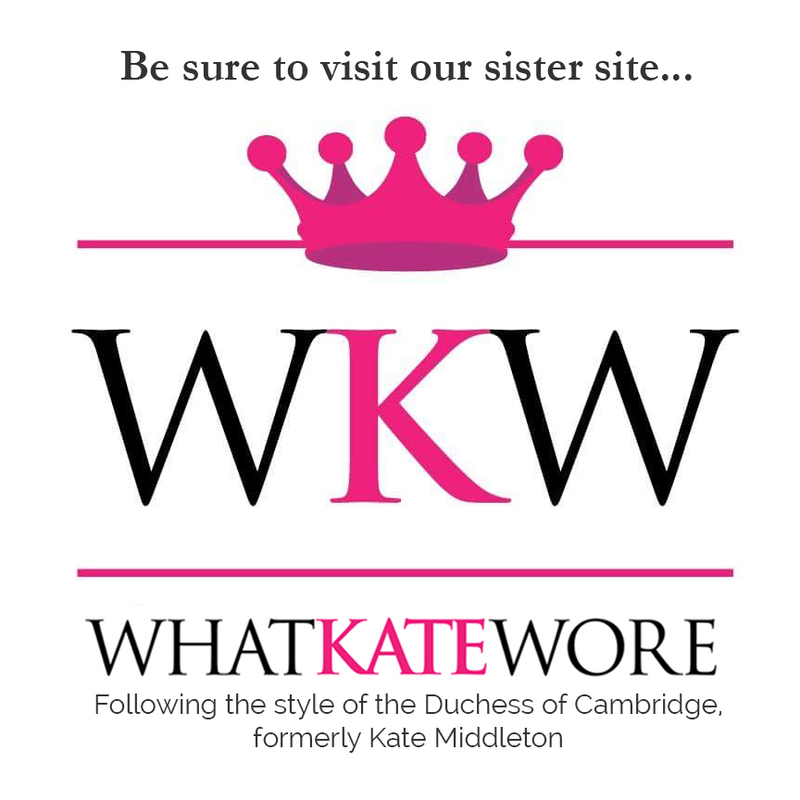 The coat is a stunning colour – it actually reminded me a bit of Kate’s MaxMara coat, so I was not surprised to see it’s from a brand the Duchess of Cambridge also favours! And what a clever idea to wear a bodysuit; I can imagine it would be annoying to worry about a regular shirt coming up out of a polyester skirt, especially in that weather. I’m really loving Doria’s look as well! And I *cannot* get enough of that video where Harry is smoothing Meghan’s hair. He looks like he just went for it, realised he was on camera and should maybe keep the public displays of affection to a minimum, then thinks “screw it” and hugs his wife. So heartwarming. That is one very classy lady – fitting in without losing herself – in spite of the seemingly insurmountable differences of ethnicity, cultural background, nationality, class, income, education, lifestyle.. what a class act! Doria looks great! As for her pashmina, I think the pattern is woven, not printed – that limits the number of colours in the pattern, but means quality. I’ve also got a general question about clothes made of synthetic fibers: One old lady, who had lived in GB for a long period in 1970s-1980s, being the wife of a high-rank embassy official (so she knew the rules of social events very well), told me that wearing synthetic was prohibited, e.g. a woman arriving to a garden tea party in Buckingham Palace in a proper-looking proper-cut dress could be not admitted because it was made of poly, not of silk. When this rule was abandoned? I’m all for a “What Doria Wore” page! 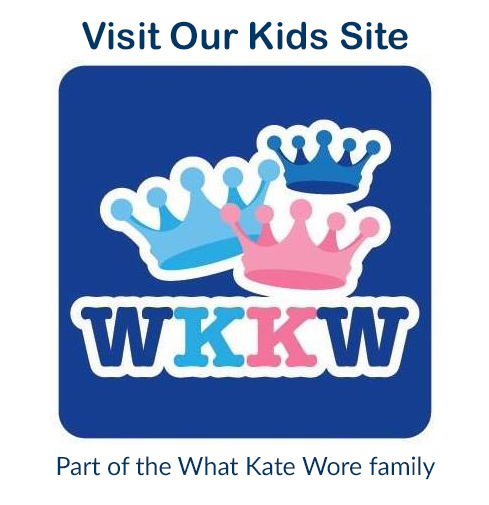 Kay – the What Doria Wore tab/section is up and running. 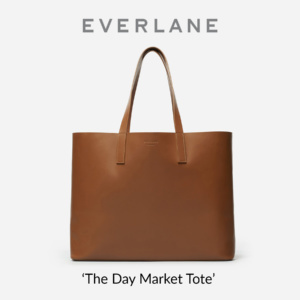 You can find it listed on the menu bar next to What Harry Wore. Thanks! Susan C.
How wonderful to see the DOS in her element at this event! Both the DOS and her mum looked wonderful in outfits that truly suited them. BTW, there were some truly FABULOUS outfits worn by the other ladies at the event. Wow–those prints! I already commented how wonderful I think this project is so my comments for the fashion part is that I love Meghan’s outfit. She might have considered tying back her hair only because of the wind. My hair is about her length and as soon as it starts blowing around I go nuts because I do not enjoy that! I love her outfit though I’m not sure I would wear the shirt simply because it snaps at the pantyline and would remind me too much of wearing a leotard like in ballet class (though much easier to remove than a leotard!). And so lovely to see Doria who is pretty much the embodiment of fall with her camel outfit! Also there’s a video of Harry going around sneaking samosas it’s quite funny! I’ve never commented before, but just wanted to say I loved this event so much, and Meghan was great here. You imagine this was special to her, as this was one she invited her mom to! And her mom looked so warm and incredibly lovely. Everything about this seemed thoughtful. Love, love, love the skirt, top, and shoes together. She looks modern and elegant, and I love this silhouette on her. The variation in texture, the white trim on the skirt, and the tortoiseshell make the black-on-black-on-black work well together. My one issue is with the coat. The wide lapels, bold shoulders, and deep neckline combine to overwhelm her small frame, and I’m not a fan of this shade of blue paired with that much black (although the blue does look lovely on her on its own). I would have loved to see the cream coat that she wore for her engagement photo call with this outfit. I was also really, really happy to see Meghan wear some cheaper pieces (when compared to things she’s worn for other engagements) here. I don’t think there’s necessarily one right answer when it comes to what’s appropriate for Meghan or Kate to spend on clothes for an engagement and understand that they’re under a lot of pressure from many different directions, but I think that looking elegant and appropriate in more modestly-priced pieces was a good choice here. Doria looks wonderful, and I hope that she’ll continue to attend occasional engagements with Meghan. Overall, I think that this is one of the warmest, friendliest events that I’ve seen the Royal Family host and it makes me really excited to see the sort of things that Meghan will be involved with in the future. 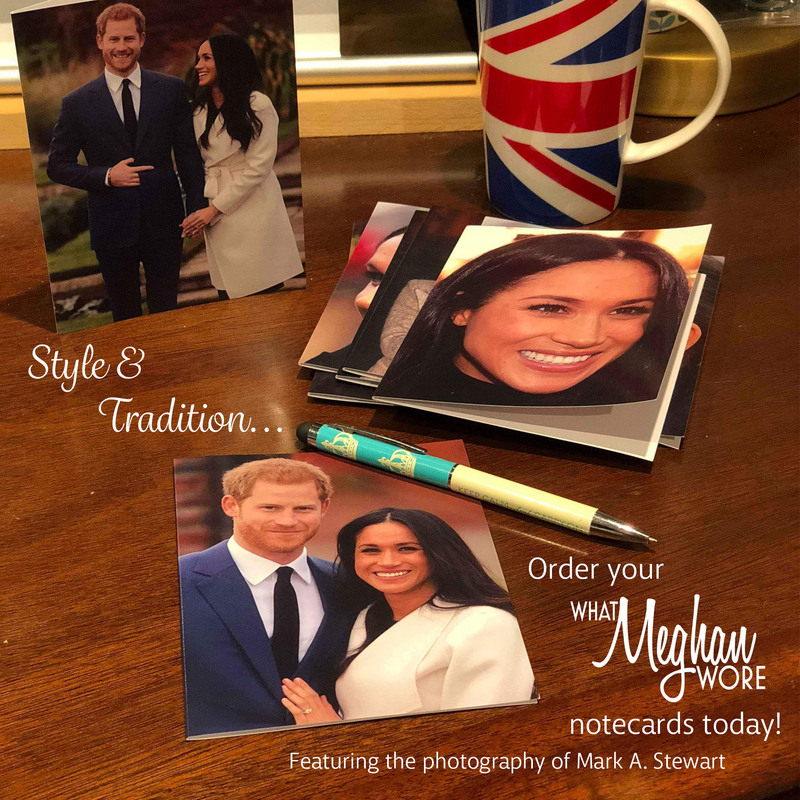 Here is Meghan doing what she does so well – connecting in a warm , genuine way in an elegant and modern fashion. What a gorgeous ensemble of an outfit! The fitted top, the fun flairy skirt, and the tailored coat in a pop of color…each piece plays well off the other. And her mom is elegance and grace personified. What a treat to have her there as an honored guest. Counting down to the Royal Tour and the outfits in store! Meghan has obviously bonded with these women. I like their resilience up to and including the fact that they could smile and be happy whilst making dinner in a borrowed space only two days a week. 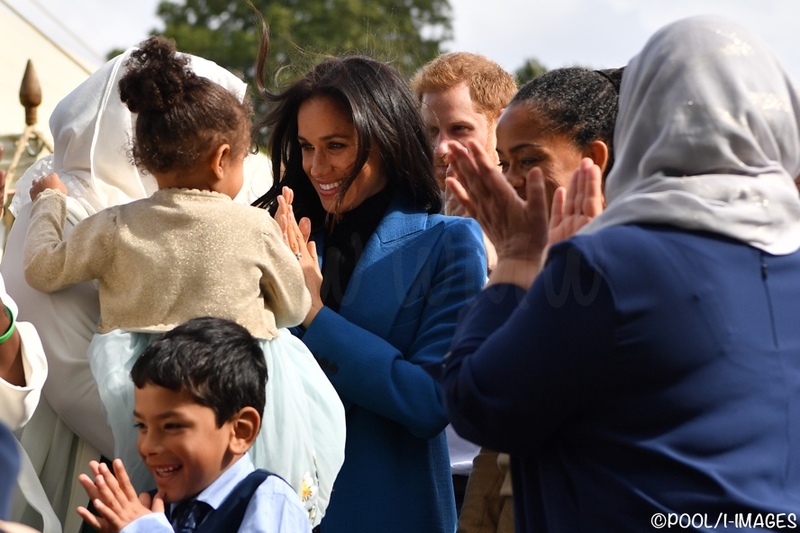 This is the second time I have seen the Duchess in this color blue and I really like it on her. I am coming to terms with the fact that she really feels comfortable in black, but perhaps she is going to add a splash of bright color to off set it as she did today. This was nicely done. Having her hair down was a show of confidence which was good to see. I am getting those shoes, PERIOD. Doria looked very elegant and proud. Prince Harry proves that the recipes must be good cause he “swiped” some food before leaving! The duchess is a very good speaker. She comes across as very genuine, warm, confident, and wise. She’s quite impressive! As for the outfit, I think a long sleeved body suit might have been a better choice. While I like when she wears color, I think it’s important that she felt comfortable and confident today, so I get the black. The skirt was very graceful and pretty. As for Doria, she was a vision. She had such a easy elegance about her and the colors were very flattering. That proud mom glow made her even more lovely. Lets put the clothing aside for a minute but what a fabulous cause celebrating the love of food across a diverse range of cultures. It is events like this that supports strong women who are passionate about their cause. Plus today the fashion was secondary but they both rocked, stylish, elegant and sophisticated. I love how Harry took a step back and let her shine today (and the taming of the hair is the cutest royal video I have ever seen!). Her acting skills are coming in handy in her speech. No cue cards for her to use-she had it memorized. It made it very relatable and felt very genuine. I would love to see more royals step away from the cue card speeches, but I understand they aren’t trained actors/actresses with years of memorizing and delivery practice. I wonder if there ever was a Cookbook Launch Party with more love, friendship and smiles than this one. 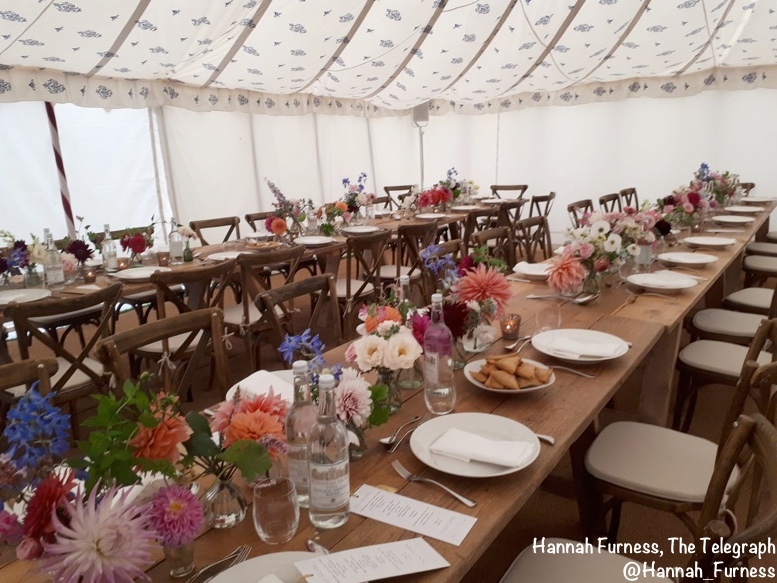 Thank you Hannah Furness (The Telegraph) for providing those background photos showing event details, those of the exquisite tent and charming menu. 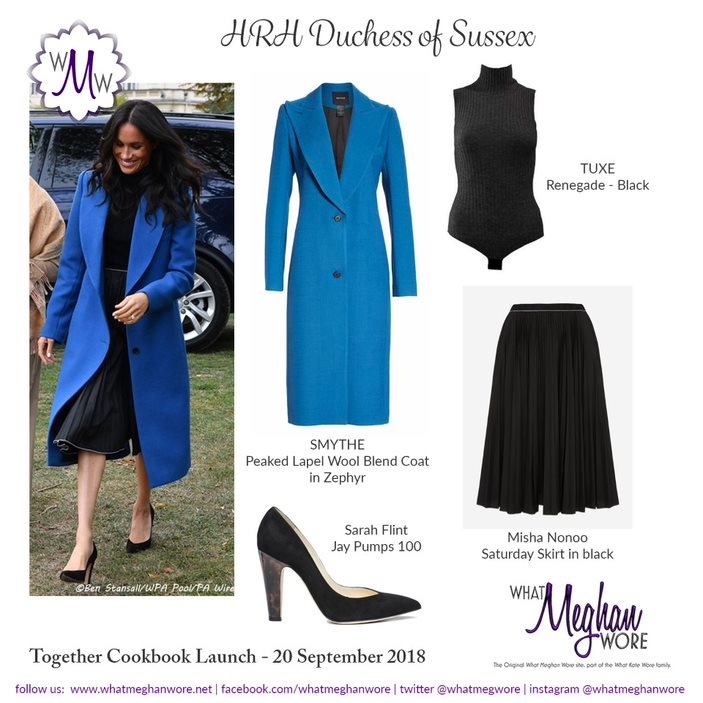 Meghan’s coat, in the saturated blue color “zephyr,” picked up on the shade in the table blossoms and the insignia featured atop the tent while her form fitting ribbed bodysuit and full broomstick-like skirt was a fun and playful combination. So nice to see Meghan and her mom experiencing the Launch together. Doria has such a lovely vibe which comes through in every photo. Curious about her necklace…am I seeing a cluster of Tahitian pearls strung on a gold chain? They all looked great. No quibbles with the pitching of outfits here (a tiny point might have been to wear a patterned or light coloured top with the black skirt). 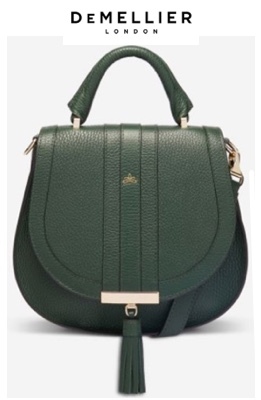 Doria’s easy, natural and understated elegance shines through. And meghan, well she is just so very genuine. I loved the marquee and the colourful garden flowers which all seemed so fitting. 65 degrees F or 21 Celsius is not considered cool or cold here. We all wore short sleeves in our office today! It was windy but the wind was warm! WOW, What a wonderful event for the Duchess. As previously said it is terrific that Harry stood back and let Megan get on with it she did wonderfully, he didn’t hover too much and didn’t he look so proud of her, considering the time she has spent assimilating to her new role and yes she has been an actress, I think she is doing a brilliant job, she has a comfortable way about her with people. That is what we want to see! She looked so lovely appropriately dressed for the occasion. I think the coat is beautiful, cut, colour, and fit. Her mother, where do you start, she wasn’t overbearing, she just mingled, so well done, class act. She looks amazing. I just love her outfit. The colour suited her so much, her pants to die for!, subtle but well chosen jewellery, but those shoes beautiful. I loved the addition of the scarf draped around her shoulders, she looked elegant and a very proud mum. Loved to see more of them together, so nice mum is supporting her daughter in a quiet dignified way, Doris carries herself so very well, and not putting it all out in the press verbally, enough already. Well done. Loved *everything* about this post: the cause, the outfits, the videos! Thanks so much! I love this outfit. The coat is a gorgeous color, and I appreciate that she took it off lol and we got a good look at the outfit underneath. It seems that she put it on back on at various times so it must have depended on how cold and windy it was. I like that she did not wear it when giving her speech. The skirt and bodysuit are fantastic – trendy and modern but still classic. 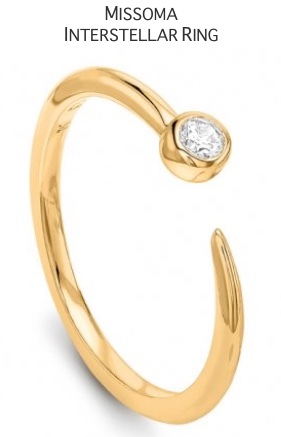 I think that’s going to be Meghan’s signature – going for the trendy twists on classic pieces. And I love everything else about this event and cookbook. I am so giddy over it. I preordered my copy and cannot wait for it to arrive. That menu for the lunch looks fantastic!! I was so surprised to see Meghan in a coat, with skirt and pumps. I’d quite got it into my head the event would be indoors and we’d get to see the palace kitchens! 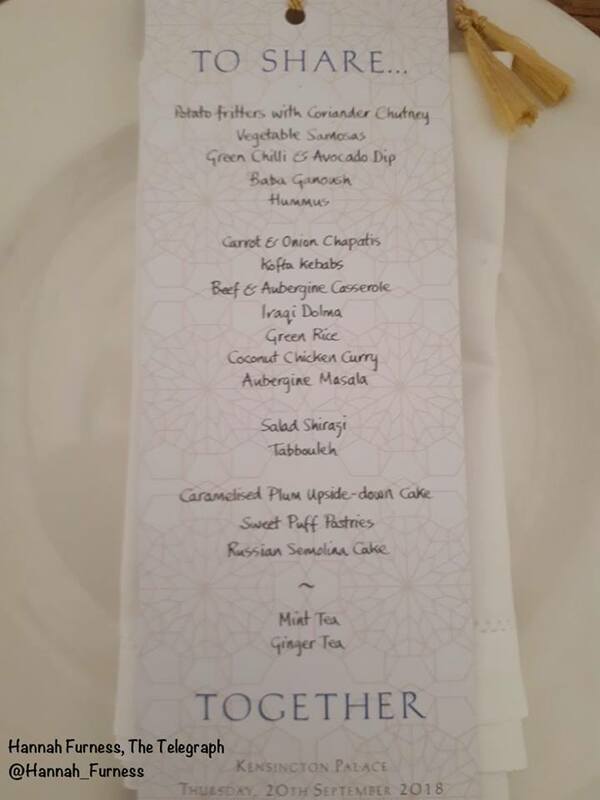 I was taken aback to see everyone under canvas and a bit sorry that the Harry and Meghan didn’t join the meal. I’m trying not to let my misapprehensions colour my view of the outfit. The coat is gorgeous, a lovely lean classic cut, and a fabulous colour on Meghan. I love the low v-neck, the top button is almost at the waist. I’m not so keen on the outfit underneath though. I have a pet dislike of pencil pleat skirts, for some reason I find them a little cheap. The fullness of the skirt was betrayed when Meghan stepped out of the car and showed there could have been real wind-assisted mishap if she hadn’t had the weight of the coat to pin it down. Keeping my fingers crossed this won’t be a problem on the coming tour. The body-top is very neat, but I’m not keen on the ribbing on top of the fine pleats, too much texture for me, though this is only another minor personal niggle. My real problem lies with how the skirt waist rides up in an unflattering way for Meghan’s body type. I love those pumps and the contrast heels work to good effect here. Oh thank you!! That makes more sense 🙂 There’s a funny clip on Chris Ship Twitter showing Harry trying to sneak extra samosas out in a napkin!! 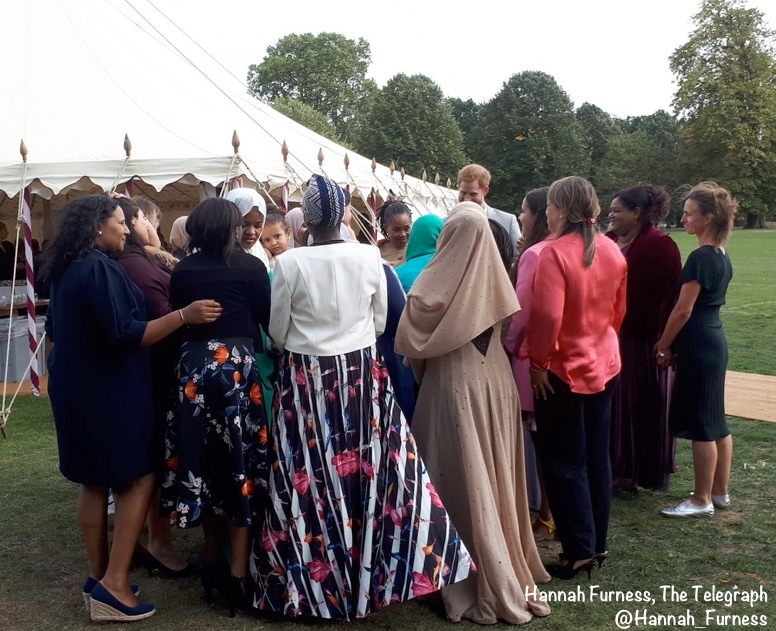 This is such a Meghan event and cause–so great to see! Also, that skirt is gorgeous. The pictures make you really wish you were there; everyone seems to be having so much fun. The duchess looks lovely and so happy. It’s so nice to see Prince Harry stepping back and letting her shine, with such evident love and affection. The outfit is nice, but the real show-stopper is her mother’s camel ensemble! Those ankle-skimming wide-leg trousers with the ankle strap pumps…what a gorgeous combination! She looks so chic and stylish, but also comfortable and confident. Adore it! She’s such a natural at these events. Her look (and speech) was polished and professional. Harry and Doria were bursting with pride. One small quibble: loose hair on a windy day while serving/preparing food. Loved Harry’s attempt to smooth her mane. This looks like a party I really want to go to. The set up in that tent looks so friendly and inviting. I adore the Duchess’s skirt–it’s just exactly my taste–and I have always loved those shoes. The coat is perfectly nice–there’s nothing to complain about really–but I am a fan of her belted coats, and I think one of those might have suited the fit-and-flare silhouette of her outfit better. Doria is an incredibly elegant woman–those impeccable beiges, and the gorgeous scarf, and those perfect gold bangles. Maybe not the right pants for ankle straps? But that’s nitpicking. My last comment about British immigrant communities got edited out; I was maybe delving too deeply into the political. I’ll try again: I am really impressed at the Duchess’s ability to so immediately make good on her stated intentions to use her position to support efforts related to social justice and women’s empowerment. I see that particularly here with her eagerness to collaborate with communities of recent immigrants. I think I had a comment that didn’t get published either, not sure what I said that went against guidelines. But I really do think the fashion is so secondary for this particular appearance. Meghan is making a very powerful statement with this project in the fact that she chose to highlight immigrant women who are foreigners in the UK. (Immigration is a very polarizing topic, there’s no way around that in today’s world and Meghan knew exactly what she was doing when she chose this project). As she said she had just arrived to London and probably felt a kinship with these women who at some point were newly arrived to London as well and were probably very welcoming to her. I applaud her for it. Thank you for commenting, Amelie. As far as the women’s nationality goes, Chris Ship of ITV mentioned that many of the women were born in Britain. JESSICA – Thank you for explaining your previous comment which went through an “admin edit!” It’s helpful to me that you were thoughtful enough to take the time to restate your opinion. It always seemed to me, since the first time I heard about this project, that it was an outgrowth of previous conversations started by the Queen in June 2017 when she and William first visited the Grenfell Tower survivors and relief workers. Then it seemed further dialog took place on subsequent visits that fall to the Al-Manaar Cultural Heritage Center by William and Harry. In my opinion I believe the Queen, along with the Royal Foundation, is in full support of this project and sees it as a human response to a national tragedy. It certainly fits into the Foundation’s “Mental Health” themes. The young Royals have some very worthwhile projects going on and it’s inspiring to me living “on the other side of the pond” to see William, Kate, Harry and Meghan using their position to make a change together. I won’t say more or I’ll get an “admin edit” myself! I agree with your comments. The Royals have had and continue to have many projects that evolve and address new issues or events as they occur. The Queen was front and center very early on for this disaster and the younger Royals are the ones that continue the work with this community. It takes a village as they say. 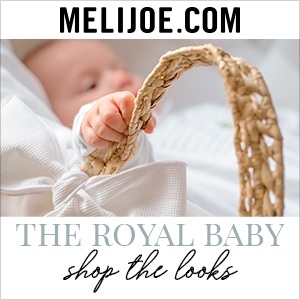 The profile the cookbook gets because of the Royal connection is excellent and will generate financial support that this initiative sorely needs. Yes Meghan is the public face for this component and did a good job; but the Royal ball was rolling for sometime before the cookbook project got going. Everyone looks fabulous – in large part because of the clear love and happiness of the day. Could Harry be any more in love and any more proud?! I’m thinking I like Dorias outfit most – probably because it is one I’d wear personally, and it is a perfect example of a monochromatic look – love it! The colour of Meghans jacket is beautiful, and I like the outfit in general, though 65 degrees and sleeveless for a California girl is unusual – I guess her time in Canada for sure rubbed off on her.